In 1898, David Connor built a lavish 20 room hotel which offered weary travelers and other visitors a warm place to spend a night or two. The first floor of the hotel had a saloon, card rooms, and billiards. Bad luck followed with the hotel burning down not once, but twice. It was reconstructed each time, boasting a grand reputation and always having each room booked. In 1931, the Jerome mines were struck with tragic incidences such as fires, floods and the mines drying up. When the mines shut down, the Connor hotel was hit hard and had to close its doors. During the 1960s and 1970s, the hotel was revived but not as lavish as it once was. But by the 1980s it had to close once again stating safety violations. It would be about 20 years before it would get the well needed renovations it so desperately needed. With all the noise and changes, many reported strange, ghostly activities at the Connor Hotel. In room 1 there are claims of whispering and a women laughing; in room 2, objects seem to move on their own, while in room 4 a ghost dog's growl can be heard through the door. Other strange claims are of sudden drop in temperature, a coffee pot turning itself off, batteries being drained in different devices, and a shadow figure. It was built in 1899 and was first known as the Clinksdale Building. This building had many different purposes throughout the years, and was once a bordello. This sweet little inn has eight rooms and apparently some ghostly guests. Some of the reports are of a ghost cat who wanders the halls and like to leaves its footprints on the beds. A woman's apparitions has been seen in some of the rooms. Some think it is a former bordello Madam Jennie Banter. 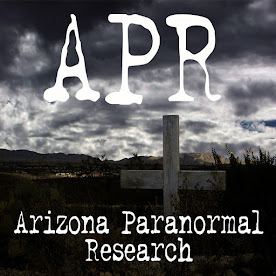 A cantankerous old man's ghost has been seen along with reports of locked doors opening on their own, furniture moving around on its own, utensils moving from one place to another in the dining room, cold spots, and many more unexplained activity. When the Jerome Grand Hotel was first built as a hospital in 1926. United Verde Hospital was equipped with all the most up-to-date and well equipped hospital in Arizona. When the mines started to dry up, the hospital was forced to close its doors by 1950. 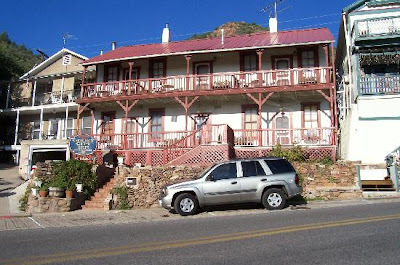 For over 44 years the structure stood abandoned until it was bought, renovated and became the Jerome Grand Hotel. The reports of paranormal activity started after the hotel opened its doors to the public in 1997. Witnesses feel the patients who died when the building was a hospital might still be hanging around. They report hearing heavy breathing and coughing coming from empty rooms. Two female ghosts have been seen wandering the halls. One of them is dressed in white and holding a clipboard, and the other resembles a woman who died at childbirth. Other claims is that of a child ghost running around in the bar, disembodied screaming, doors opening and closing by themselves, and unseen footsteps in empty hallways. Constructed sometime in the 1890s, this building has been a boarding house, funeral home, art gallery, a religious retreat, and finally the Ghost City Inn. Today the inn has many reports of ghostly activity. In the Cleopatra Hill a woman's apparition has been seen, a male spirit has been reported in the Verde View room, doors shutting on their own, and disembodied voices. 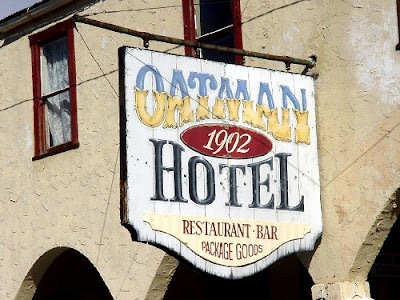 The Oatman Hotel is famous for many things from who used to lay their hats there to the claims of ghosts roaming around the building. The hotel was built in 1902 and is the oldest two-story adobe structure in town and all of Mohave County. Many miners, politicians, lawmen, outlaws, and movie stars stayed in the lavish rooms. 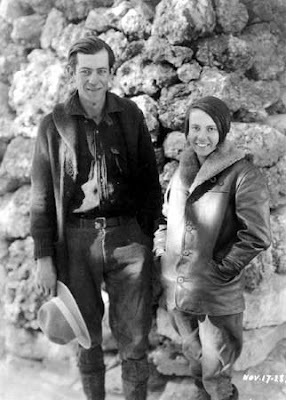 After being married in Kingman on March 18, 1939, Clark Gable and Carol Lombard honeymooned at the Oatman Hotel. 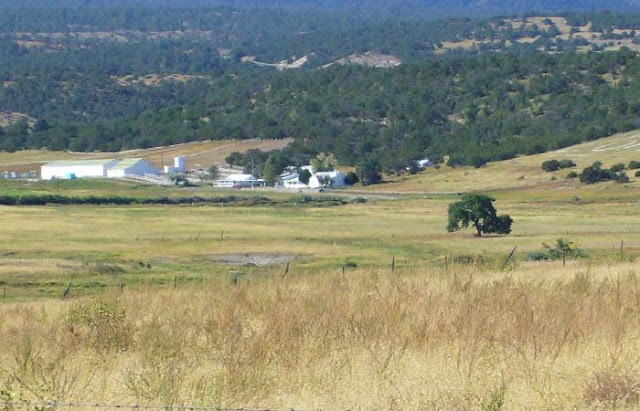 The remoteness of the place was one of the reasons Gable kept coming back to the hotel. He also enjoyed playing poker with the miners. Today, visitors and staff have heard laughing and whispering coming from the unoccupied room the two stayed in. 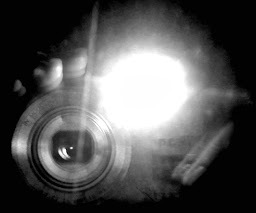 One claim is when a photographer took a picture of the empty room, an apparition of a man appeared in one of the photos. Other ghost seen in the hotel is that of an Irish miner named William Ray Flour. The story is told that his entire family died on the way to American and he was so upset that he began drinking heavily. He ended up drinking himself to death, died behind the hotel, and his body was found two days later. The staff just buried him in a shallow grave right where he died. His ghost has been seen in his old room and the hotel staff has named him “Oatie”. Oatie likes to play pranks such as opening windows and pulling off sheets in his old room. People have reported hearing a bagpipe sound coming from his former room as well as feeling a cold spot with it is very hot outside. The hotel seems to have lots of other playful spirits in many of its rooms. The bar had reports of money being lifted off the bar as well as glasses floating in air. Witness have claims of lights turning on and off by themselves, the sounds of creepy disembodied voices, toilets flushing in empty bathrooms, and footprints which appear on recently cleaned floors. The Oatman Hotel no longer takes in guests but still serves as a museum, restaurant, gift shop, and much more. The location, accommodations and staff were great. The room was priced so nicely, too. I am going back for sure. Rooms were swanky and views were nice, too.